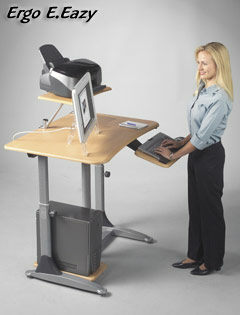 The Sit and Stand Computer Workstation is a functional and stylish design with ergonomics in mind, the Ergo E. Eazy is fully adjustable for each user's comfort. The Ergo E. Eazy is part of our True Adjust® product line, which means any adjustment can be made without removing any equipment, providing superior convenience and usability. 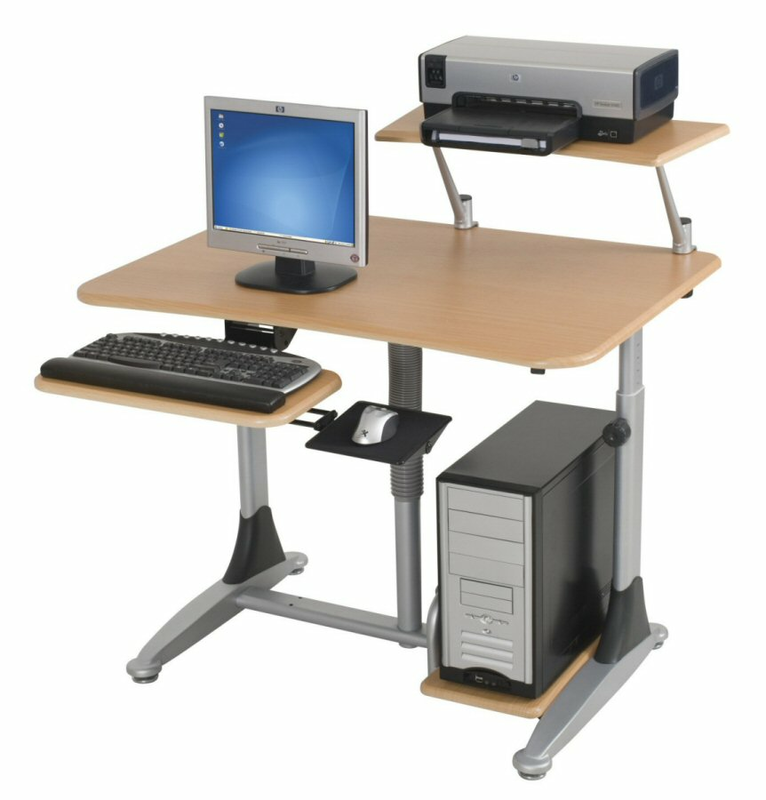 Featuring a brushed silver frame with teak scratch-resistant laminate surfaces, the workstation is easily adjusted in height from 29" to 39" with a pneumatic lever, allowing the desk to be used as either a stand-up or sit-down workstation. The keyboard platform includes a padded wrist rest, and is fully articulating, swiveling from side to side and tilting from -15º to 25º for customizable comfort. The keyboard platform can also be adjusted from 1 1/2" below to 4 1/2" above the work surface. The printer shelf mounts anywhere on the back of the work surface for easy accessibility, and measures 25 1/2"W x 11 3/4"D.
The mouse platform can be placed on either the right or left side of the desk, tilts independently, and measures 7"W x 8"D. A desktop CD holder and a CPU holder that can be used on the right or left side of the desk are included. Add easy mobility to the workstation with a set of 3" locking EZ casters, available separately. The Ergo E. Eazy allows a user to easily alternate between standing and sitting for a more ergonomically correct work position. Pneumatic control allows height adjustment between 29" and 39" high. Includes a fully articulating keyboard platform that swivels and tilts from -15º to 25º. Keyboard platform adjusts in height from 1 1/2" below to 4 1/2" above work surface. Printer shelf measures 25 1/2"W x 11 3/4"D and can be clamped anywhere on the back work surface. Mouse platform (7"W x 8"D) can be used on right or left side, and tilts independently. Unit includes a desktop CD holder and CPU holder that can be used on the right or left side. Available with a brushed silver frame and teak tops. Optional 3" EZ casters available separately.